The call for a ‘Swachh Bharat’ irritates me, because my city is far from being clean. Bengaluru, my charming garden city, is being destroyed every day. Of course, the burgeoning population could be the primary cause, but what is happening to the civic sense of the citizens? What role do the civic authorities play? Most main roads are dug up for construction of flyovers, metro rail or some road widening project. Don’t even ask about the roads within residential areas. Beautiful bungalows are mindlessly demolished to build apartments with a minimum of four storeys (with one more illegal storey, of course). Thus, construction is never-ending. The roads are covered with sand, mud and gravel. The bustling traffic creates a continuous layer of smog in the city. This pollutes the air severely, making adults, children and infants suffer from lung diseases. One must not forget noise pollution. Drilling, digging, boring, welding and breaking sounds continue till late nights. If we, the citizens raise these issues, we are at best ignored, and if we are persistent, rebuked. Trees are being felled like it is nobody’s business. Only God knows what the forest department is doing! People like us, who know the value of trees and object to cutting of trees, or at least want to preserve the trees planted within our compounds, are seen as anti-socials. Our concrete-loving neighbours cannot put up with leaf litter or fronds. Precious foliage for such people is garbage. They would rather be in their air conditioned rooms than enjoy natural breeze in this sizzling summer. Tomorrow when the groundwater resource is gone, they will have the money to purchase water, maybe recycled from toilets! The slogan ‘open defecation free India’ is so farcical. I wish the Prime Minister and his team would visit the residential areas in metros, especially Bengaluru. It seems like most Bengalureans have no toilets in their homes. Through the day, you can see people peeing in every empty corner of the city. Abandoned old buildings, or buildings under construction where work is temporarily suspended, are conveniently used as public toilets. Many commercial buildings do not provide toilets (though the government proudly announces constructing toilets in villages). Hence shopkeepers use the walls and spaces around the buildings and the streets nearby, as toilets. Just the other day, I attended a function at Kannada Sahitya Parishat and I happened to walk along the broad street next to it. I was so shocked at the stench, that I had to cover my nose and walk! Right in front of my house, there is a large space belonging to the Karnataka Housing Board (KHB). 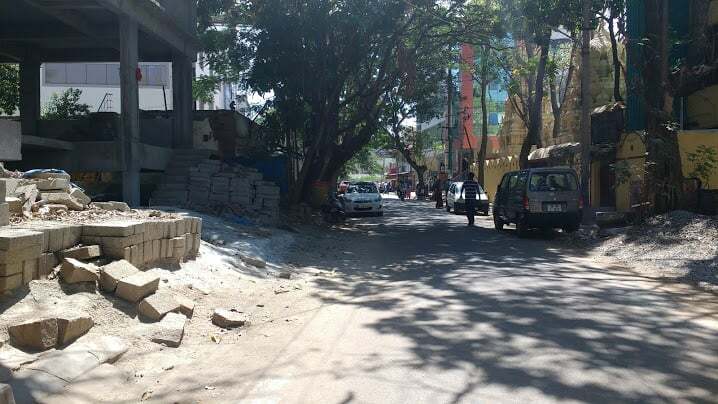 This area is regularly used for dumping garbage. Also, there is mud dug up for construction, and the area is used as a public urinal by all passers-by, including construction workers, local shopkeepers and students! Drive through Bengaluru, and this is the state everywhere, except for a few thoroughfares through which VIPs zoom past. 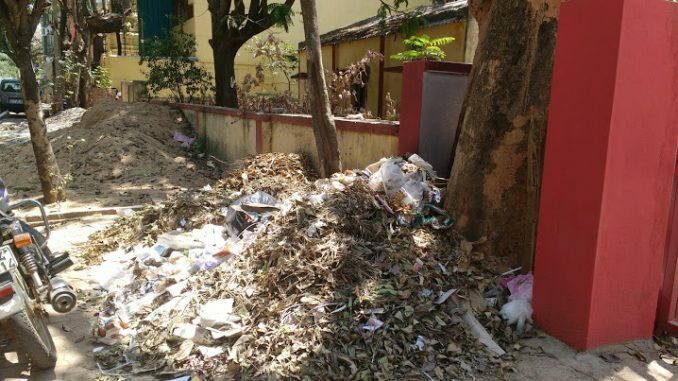 I was shocked to read that Bengaluru is competing for the Swachh Bharat award. What a joke! Awards should be given only after physical verification by responsible officials, and not on the basis of records – ‘so many toilets built’, ‘so many tons of garbage cleared’ or some other baseless claim. Just drive along the highways in all directions. The garbage collected from our homes are dumped along the highways. Nobody is willing to take responsibility for the garbage dumped by commercial establishments along roads in every locality. Most stormwater drains are blocked by garbage and foliage. But only when it rains heavily, flooding low-lying areas, do the authorities wake up. No new construction follows regulations on set-off area or parking lots. Bengaluru was definitely not this bad 40-50 years ago! Civic authorities were more responsible. People led simpler lives and hence the amount of garbage generated was limited. We carried cloth bags. Vendors would pack groceries in newspapers. Plastic was rarely used. Most of us never used diapers for children, managing with pieces of cloth. Children too were toilet-trained early in life. Today, it is disgusting to see garbage mounds strewn all around with stray dogs pulling out diapers and sanitary napkins from them. How hygienic is this? We, residents along two roads surrounding the KHB land, had appealed to the BBMP to convert this space into a green island. I even lodged complaints about the misuse of this land and about the state of our road, 20 percent of which is covered with construction materials, 25 percent by eateries and 30 percent by illegally parked vehicles. The sand and mud strewn all over the road is hardly ever cleaned up. The footpath is strewn with garbage, debris, foliage and the corpses of the trees axed down. There is smog in the air always, and we are unable to open our windows and doors. My complaints were automatically rounded off as ‘already attended to’ in the SMS sent by BBMP. The situation, however remains the same. People of Bengaluru have to seriously introspect, discuss and pledge to change such dangerous conditions before things go beyond repair. With summer knocking on our doors, the city is ripe with seasonal infections. The planners, still not satisfied, are preparing to chop another thousand trees in the name of the elevated corridor. Bengaluru will turn into a dry desert sooner than the scientists are predicting! Where will I then go to breathe fresh air and drink clean water? With High Court directing that ward committees be formed, corporators are to submit their nominees by Tuesday in a special BBMP session. Quality of Life of Bangalore has declined since 2010. Vast majority of wards suffer from contaminated water, poor sanitation and high pollution levels. How to start? What are the non-negotiables? What is negotiable? What about training? Citizen Matters presents a step-by-step guide and more. “Swatch Bharath” is wonderful ideal. All action to achieve this should start from bottom of the society, which lives in abject poverty. Look at the living and working condition of labourers brought to cities for building construction and the “Pourakarmas” for the cleaning of the Roads and sanitary work. Most of them are not provided proper living space or protective gears required for their work. Yes, if you open the rule books there are enough rules to cover all eventualities occur in the world, but none of them are followed. Huge amounts are spent to keep the City clean.Then why the Garden City has turned to Garbage City. The main reason is lack of commitment or pride in the work taken up by the elected representatives. BBMP has taken a huge job by adding all the villages surrounding the City of Bangalore, which they cannot manage. 1. Huge bins for different kinds of waste – paper, tin, glass, wet and plastic at strategic points on all streets, with lids that cannot be opened by animals/birds, like in zurich and canada. 2. The waste should be segregated compulsorily at all homes. Home collection is not done in all areas. Slum development board homes are surrounded by filth and garbage. As though the poor do not need hygiene and cleanliness! If the city is to be clean , all the localities have to be clean. 3. The garbage treatment should be seriously discussed , studied and implemented. We individuals can only do what we can -lead minimalistic lives, avoid creating more trash, segregate waste properly and dispose the same only as per regulations, compost the wet waste wherever possible. 4. The value of urban greenery cannot be ignored for reducing noise and air pollution. We have to grow more trees, cover open spaces with grass and plants or concrete (wherever that is not feasible). In Singapore, canada or US, there is absolutely no chance of dust because of this policy. I have written about the urban greenery and civic services of Singapore earlier. As Mr Kulkarni says, our politicians, beurocrats and planners keep travelling all over the world. Even pourakarmikas were sent to Singapore ( as though they have any power to change things here). What’s the use, if they do nothing to change our sick systems? 5. Yes, all of us are jointly responsible. I am already doing my bit – i compost my wet waste; i lead a minimalistic life and avoid trashing to the extent possible:; i use only my well water and recharge my groundwater by collecting all rain water and bathroom/kitchen water;i have 35-,40 trees in and around my house. Can i keep saying this again and again mr.karthik? No magazine will publish such lengthy articles. Don’t i have a right to even vent my frustration when i am a responsible citizen? Layouts of Bangalore have no place for garbage containers which can be hydraulically emptied into trucks. It is time BBMP identifys suitable places and squire them for the purpose by paying compensation equivalent to what is paid by Metro Rail in the city. Second step is segregation of waste. Third step is BBMP should buy all waste whether plastic of any thickness, any paper, any rags almost everything lying on the road. You will see rag pickets will not leave a single peice on the roads as it will get h money for them . Roadside dust is never taken away causing unimaginable eternal dust pollution. This should be priority. Our politicians visit Singapore, Paris Rome etc. for study but never learn to know why those cities are clean. If you go deep you get frustrated to see the callousness and indifference. Now I have come to the conclusion that personally I will not throw anything anywhere, will keep area Infront of my house swept and cleaned, will dispose household garbage duly segregated. I don’t think I am capable beyond this. Neither people nor authorities change. One thing is I accept swatch bharat in Bangalore is joke only. We can’t blame only authorities . Citizens should have sense before throwing garbage into lakes, drainage, road side. First step is people should be more sensible towards cleanliness, then we can question the authorities if they don’t provide facilities for waste management. Prominent Kempe Gowda Road KG Road, everyone is familiar , we have Bank of India Building and KempeGowda Maharaja complex, the cross road is 3rd cross, just visit here,we see gargarge autos , smell to urine, can’t the bank keep it compound clean under CSR initiative just 60 feet on 2sides by planting plants.This shows how to keep your city ,building clean, it should by everyone not only BBMP. This is very true.Day by day condition is going worst. Near kadukodi they are doing road construction since 9-10 months. Residential area road, don’t have to ask even. They dig on and around, but not bother to even construct road there. Too much traffic, we public have to face daily while commuting to and from office. Citizen team, Kudos on the many good articles on the site. But, this article, being the headline, I expected it to be a well researched piece about the garbage problem plaguing our city. Unfortunately, this article is more of a rant on the sad state of affairs of the city. The article seems to be filled with anecdotal data-points and without coherent structure where the blame is ping-ponging between a federal program and the local civic bodies. I reached the end of the article and felt the same exasperation that many of our citizens have been feeling the past few years, ending with the common hand signal (the one which symbolizes “what can we do” in Kannada). I was hoping for a more structured article discussing the issues and presenting avenues for improving the same. thanks! Mr karthik, what is there to research? After trying all avenues like talking to people who dump garbage, debris and pee there, directly and appealing to the authorities in writing and over phone, i wrote this out of frustration. Citizens pounce on us when we advise or request them to honor civic rules. One guy even threatened me of dire consequences if i fo not mind my business! Authorities promised to attend my complaints but did almost nothing. My complaints got rounded off ad ‘attended’. My appeal to convert the land to a green island is not responded so far. So, what else do you want me to do as an individual, when most of my neibhours are only interested in converting their beautiful houses to huge commercial complexes?